Bioscan Research’s innovative device that detects traumatic brain injury has won Unitus Ventures (formerly Unitus Seed Fund)’s StartHealth competition which offers a funding of Rs 6 lakh in cash. 12th July 2017, New Delhi: Out of 186 startups who applied for Unitus Ventures (formerly Unitus Seed Fund)’s StartHealth competition, Bioscan Research has been chosen for a fund of Rs 6 lakh in cash for its innovative device that can detect internal brain injury. Along with Nanosniff Technologies, which was declared as a runner up for its innovation for early detection of heart attack, Bioscan Research can now pitch for a funding of up to Rs 4 crore at Unitus Ventures (formerly Unitus Seed Fund)’s AmpHealth program. According to neuro specialists, symptoms of brain injury, called delayed haematoma, could be misleading post the road accident. “In this, timely transportation of the patient from the affected area to the right facility is extremely important. In case of delayed haematoma, the symptoms could be misleading such as some sort of headache and discomfort for which patients usually have a painkiller and go for sleep, instead of consulting a neuro specialist. In this case, brain injury detector could be a saviour via timely diagnosis and treatment,” said Malik. The target audience for the product, which may cost around Rs 1 lakh, could be general physicians, clinicians, hospitals, family doctors and paramedic staff. 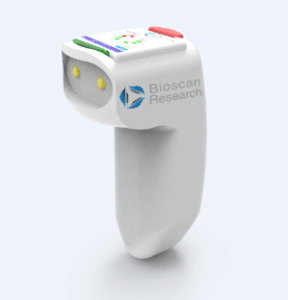 Bioscan’s plan is to refine the product specifications and functionalities in 3-5 months and develop the final product in one year, followed by setting up of the assembly plant. “We are currently testing our handheld system in hospitals. We have simulated the diseases in the lab, tried to detect it and the device has worked fine so far. Now, we are at clinical testing stage and beginning to test it on real human subjects,” said Malik. Similarly, the other device, tentatively called Infarction Sensor, by runner up company Nanosniff Technologies is being developed to detect early cardiac marker called troponin, which gets released into the blood in case of a heart attack. “Whenever there is a heart attack, the device can analyse the blood with instantaneous results, through which a physician can learn whether the person is having heart attack or not. Heart attack is a slow evolving process, typically with a chest pain, which could also happen due to acidity post the meal. About 50% of the cases do not get shown in ECG results. With our device, it can be easily detected after detection of cardiac marker-troponin in the blood. The device can be deployed in the primary healthcare settings, small clinicians’ offices, diagnostic labs and hospitals,” said Dr Nitin S Kale, co-founder and chief technology officer, Nanosniff Technologies. So far, over Rs 3 crore have been invested in Infarction Sensor. “It is going to take some more investment of time and money to conduct laboratory trials and launching the product in the market. The trials would be split into two parts. First would be limited scale trials that should happen in about 6-10 months or about a year’s time. Thereafter, we will go for full scale multi-centric hospital trials, while we identify other stakeholders like vendors, equipment manufacturers etc in parallel. May be by the year 2020, we should see our device in the market. The estimated cost of the device could be Rs 1 lakh,” said Dr Kale. “There are about 500 districts in India, 10,000 towns and 60 million heart patients, and hence the demand for such sensors is huge,” added Dr Kale, who is a part of the core team of 12 people developing the device. In the 4th edition of StartHealth competition held recently, startup ideas were categorised into four focus sections – artificial intelligence, analytics, home healthcare and medical devices. “Over the last 4 years, we have witnessed increasing number of startup ideas from different areas of healthcare. This year, we focussed on startup ideas under the four categories. In artificial intelligence, we wanted to see if there are any ideas being worked upon, while analytics make both diagnosis and treatment more efficient and cost effective. Home healthcare gets the significant traction because these days patients want their illnesses to be managed and monitored at home. Medical devices have potential to alter the way treatment can be given,” said Milind Shah, healthcare venture partner. Some of the criteria basis which the decision was taken were how does the startup idea help to reduce the cost, improve access and benefit bottom of the pyramid. “How big is the need in the country for the kind of innovation that a startup is talking about? Who all are the competitors? How different is the startup idea from the other ideas in the market? Has the idea been implemented before? Many of the startups succeed not only because of their innovation but good business model also. We also look at the leadership of the startup, whether it is a one man show or a team of people who bring complimentary skills and experiences to the project. Presentations also play a major role, as it is important the way ideas are pitched to the jury,” Shah said while explaining the criteria basis which Bioscan Research was chosen a winner and Nanosniff Technologies a runner up. As for the next steps, the winner and the runner up can now pitch for a funding up to Rs 4 crore. “We have a programme, called AmpHealth, which is non-dilutive funding and it catalyzes the growth of the startups where they can exceed their funding, if they have good business models and customers. The winners are eligible to apply for this grant of about 250,000 dollars. The process will begin very soon,” concluded Shah.